Darjeeling White Tips (India) - 2 oz. Character: A very rare tea from the Darjeeling area - each leaf is hand selected. The cup is faintly muscatel with a hint of white wine notes. White Tip is one of the of the world's finest teas. 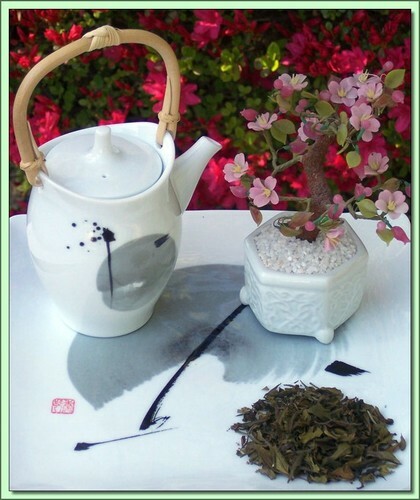 The tea is produced using the two leaves found around a new tea shoot at the very top of the bushes. These are hand sorted and then gently steamed and dried under a soft heat. The result is an incredibly light fresh flavor with mild muscatel notes, typical of all good Darjeelings, rounded by underlying tones of white wine. Pair the unbelievable flavor with the fact that White Tips contain at least 3 times the antioxidant polyphenols of green or black teas, and have lower levels of caffeine, and you have a winning cup. Hot Tea: This tea is best enjoyed by pouring 180F/90C water over the leaves (1-1 1/2 tsp per cup) for 3 minutes (longer=stronger). Don't remove the leaves. Infuse repeatedly 2-3 times using higher temperatures & shorter infusions until flavor is exhausted.